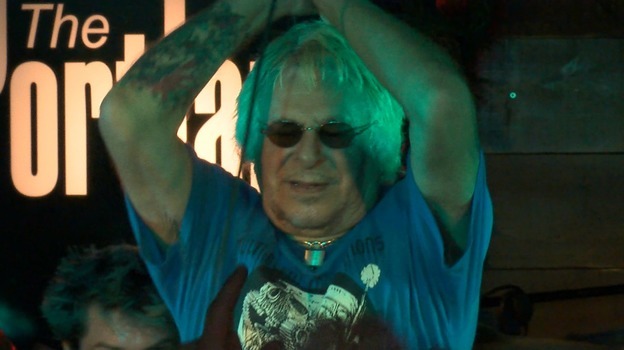 I was featured recently in an Anglia TV special marking 40 years since the punk movement. This two part mini documentary series is about punk in the Eastern Counties and was hosted by Anglia TV’s Matt Hudson who was a big punk fan and UK Decay fan. Matt was the same presenter who featured UK Decay and Bauhaus in “The Origins of Goth” feature back in 2014. There are also some still shots of early 1980’s Luton Punks featured on the show taken from UK Decay’s Communities web archive. 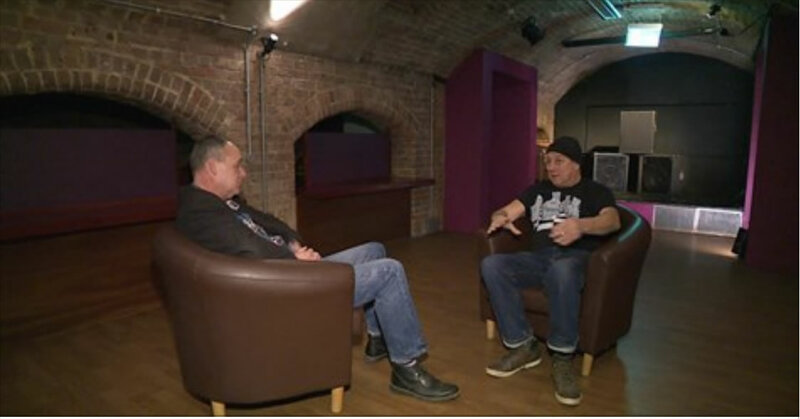 Interviewed for ITV Punk Special out in 2018! Yesterday I returned to the Hat Factory Arts and Media Center in Luton to take part in an interview with Anglia TV’s Matt Hudson. 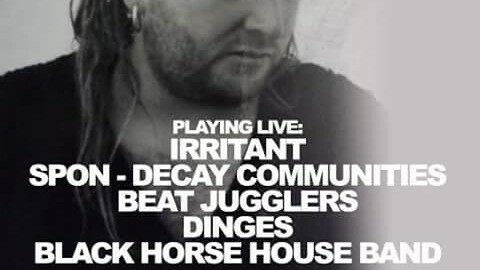 He is a massive UK Decay fan and sent me a host of live tapes ten years ago when we were getting the UK Decay Communities website going. Matt is putting together a show that highlights the birth of the punk movement in the Anglia region and what it was like growing up throughout the Punk era. It is something that he is quite knowledgeable about as he grew up in this scene himself. So we had a couple hour chat with edited highlights to be seen on the forthcoming production due out in the new year. Besides your truly Matt has interviewed Steve Ignorant , Chris Needs who played guitar for The Users in Cambridge, Matt Whorley whose book No Future has just been published by Cambridge University Press and Jonty Young who runs the Punk in the East website. There will also be a special emphasis on tales from the gig at the end of the pier, The West Runton Pavilion. So a lot to look forward to! I have a couple of tracks coming out on this forthcoming release due out in June 2017 on Cherry Red. This will be one of the most compelling Goth compilations ever to see the light of day. On disc one, I co wrote and performed a song I brought to the mix after I was ‘poached ‘ by UK Decay from Pneumania in 1979 – ‘Black Cat’. This became one of the most enduring UK Decay live tracks during both the early and later periods. 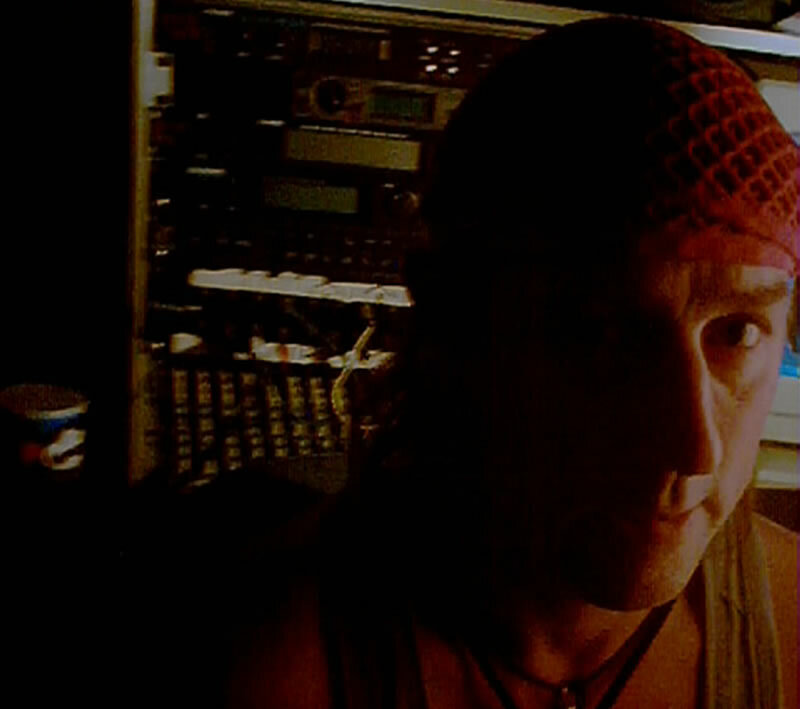 A few tracks later I appear with- IN Excelsis on a track called Carnival Of The Gullible’. I formed In Excelsis with Mark Bond and Errol Blythe formerly from Post Punk legends, Ritual and Colin Rocks who later joined Mark. E. Smith with The Fall.. Errol and Mark were left stranded after drummer Raymundo and Bassist Jamie were ‘poached’ by Ian Astbury form Southern Death Cult so after UK Decay split at the end of 1982. This was a weird period for me, I flirted with Gaynor and Rick from World Circus, Jammed with Rob from The Wall , then finally teaming up with Mark Errol and Colin to form IN Excelsis in 1983. Richard Anderson got in touch with me in 2016 explaining his interest in creating the ‘ultimate’ Gothic Rock compilation, so I digitally re-mastered ‘Black Cat’ especially for this compilation. The set comes in a deluxe hardback book format featuring 80+ tracks, with over 18,000 words of sleevenotes (including artist contributions) and unseen images. The chair and MC for the night was Fahim Qureshi from Luton Culture whom was more than well qualified to host the proceedings as Fahim or ‘Fame’ was an active spiky haired punk about town back in the late seventies. Back then he was promoting some of the earliest punk gigs in Luton including the Barnfield College Gigs and was a co-hand at promoting the infamous Crass, Poison Girls and UK Decay gig at Marsh Farm in late 1979. I prepared a powerpoint slide show of images of gig posters, press cuttings, punks, punk bands of most of the early events that happened in Luton from 1976 onwards. This acted as a stimulus for discussion with ourselves and the audience. Forty years is a long time and memories can sometime play tricks, it can be good to share with others that were around at the time. Sometimes forgotten stuff can resurface in discussion with others and alternative insights can enlighten a memory. Hence I think everybody that participated provided real interest and content to the discussion. Abbo had attended his Mothers funeral late after getting caught up in the ‘Black Friday’ traffic that afternoon so it couldn’t have been more difficult for him. I don’t know how he managed, most people would have been in pieces , I certainly would! You have to have maximum respect for the man’s professionalism. We talked about the early punk gigs in Luton including the first at the Royal Hotel in Mill Street on October 6th 1976 with The Damned playing their tenth ever gig. There was a few in that company who had been there all those years ago! Including myself! We talked about the gigs and the bands , the great creativity , the great antipathy that punks suffered in what was difficult times. 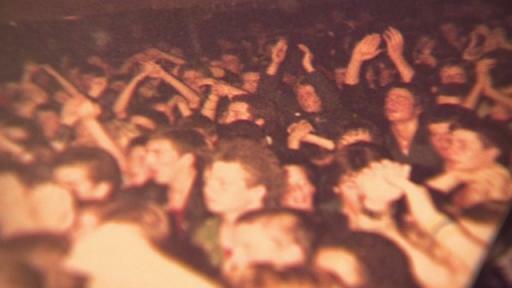 There was often trouble at gigs back in the day, but this was the price to be paid for deliberately stepping into what was then a tribal culture which to some seemed hell bent on nihilism and disorder, To us it was an exciting new territory of music , sound and anti-fashion voyeurism to be explored and populated. In an age before the interweb we networked , created anarchistic fanzines, painted our jackets, wore cool punk badges (or buttons as they are called today) , dyed our hair with crazyclour (no wonder many of us ain’t got any hair left today!). Some of us promoted gigs, some of us did poetry, we created artworks and some of us did music , then of course it was the band! Our band. So we squatted an old house in Wellington Street and turned the coalbunker basement into a rehearsal room. We soon got to know The Resistors another young band of whippersnappers he he! particularly Martin and Steve Harle. some of the other chaps in the Resistors were in the audience and were delighted to see their younger selves up on the screen! So there it was, we had created a potential meeting point that would help launch Luton’s Punk scene. Which by 1979 it did. Snow White had now changed name to Pneumania and The Resistors, now with Abbo on vocals to UK Decay., We collaborated on a ‘Split Single’ , gigs and just about everything else! 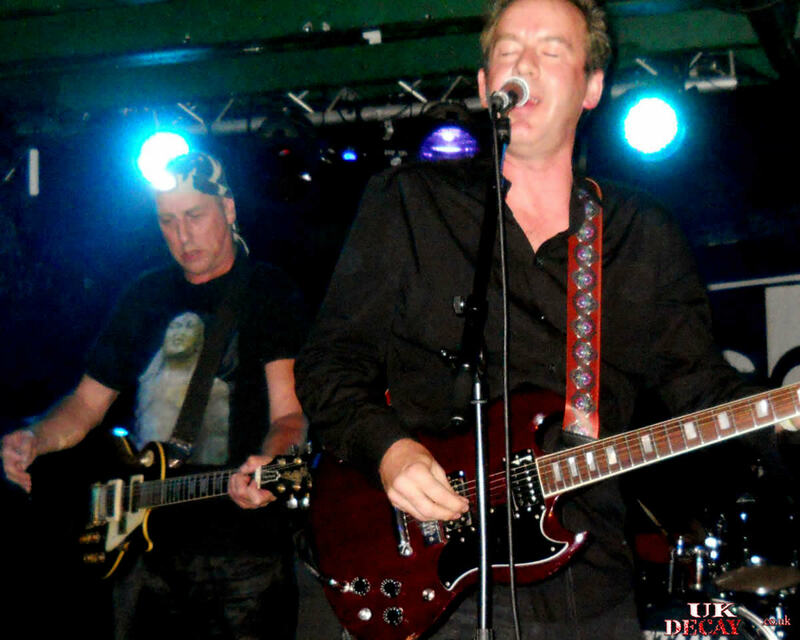 Later that year I joined UK Decay on guitar and it went on from there! The Split Single was Luton’s first D.I.Y release , we pipped the Jets, now The Tee Vee’s and The Friction’s ‘split single by a few weeks! So the Luton punk discussion for a time looked at this what we called ‘the second wave’ and actually some called it the ‘third wave’ after the initial explosion of 76. 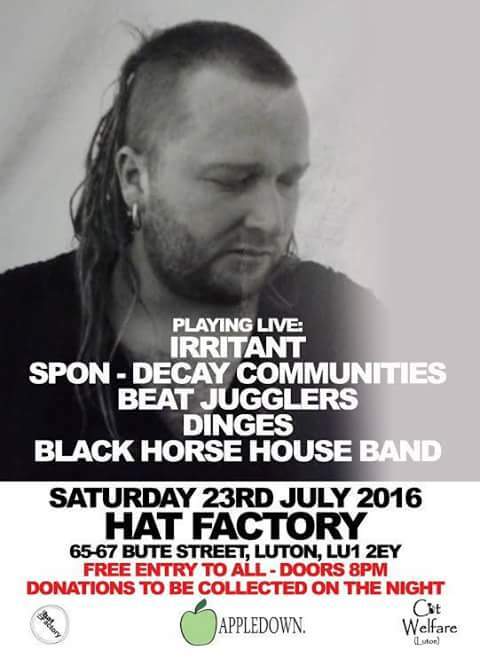 I guess the UK Decay part of Luton’s punk history has it’s place and I guess it would be natural for Abbo and I to talk about it! It wasn’t all discussion either, we broke up the evening with half a dozen or so songs which was the closest thing we could do to being ‘unplugged’. Justin Saban joined us onstage to help ‘glue’ our performance together. He brought along a bespoke stompbox which provided a rhythm and we played through a number of songs which included our first ever live performance of ‘Drink’ from our recent ‘New Hope From The Dead’ album. For that I created an mp3 of the violin part and played my guitar with my cell with the mp3 playing – all going through my stomp boxes and space echo! It was a first! Being as it was an ‘unplugged’ performance we had every excuse to sit down and play which to some might appear ‘unforgivable’ But it seemed to be about right for the timbre of the evening. Eventually the evening rolled out to questions then more personal meetups at the bar later. The feedback I got was really good, we had provoked a keen interest and it was really good catching up with some of the peops from all those years ago. I guess next meettup and discussion wil be for the fiftieth in a decades time. I make an appearance in the The Dump It On Parliament Revisited documentary a project I was significantly involved with and very much enjoyed over 2015. 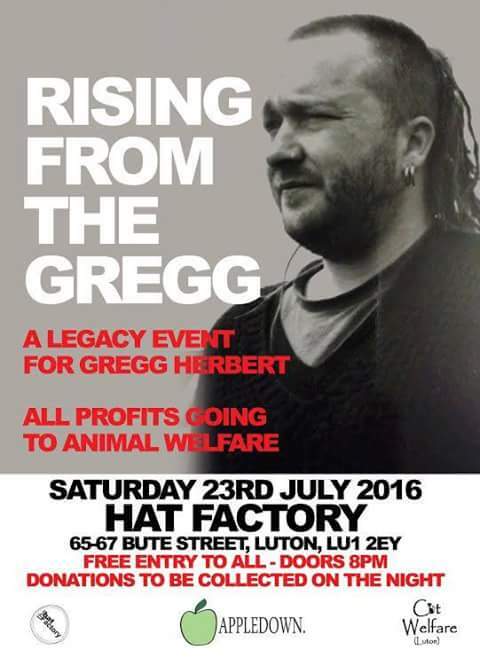 I shall be performing a small solo set alongside Irritant at my dear late friend’s Rising From The Greg tribute event at the Hat Factory in Luton on July 23rd. This is an event supporting local charities. Not too sure at this point, what exactly I am going to do on the night but I am brewing up some ideas that will involve my trusty guitar, we shall have to see what happens!